Live an exclusive experience following the footsteps of Elena Ferrante's novel "My Brilliant Friend" that take places mainly in Naples and partly on the Island of Ischia. Art, culture and good food in two iconic destination of southern Italy. 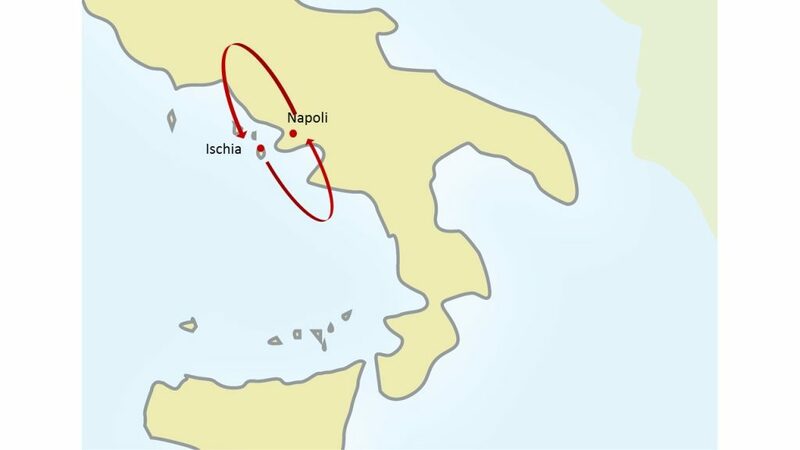 The tour features: Naples and Ischia Island. Discover the traditions and the history of Naples through its alleys and churches but also experiencing how to cook the traditional Pizza with your own hands. Relax and enjoy in the breathtaking scenaries that the sunny Ischia Island offers with its bright green of the vineyards, the bluish green of the olive groves and the dark green of the orange and lemon groves. Only an amazing sunset boat tour will allow you to experience the peace of the Island. 5 Nights accommodation in exclusive and fascinating 4 stars Hotels, with full buffet breakfasts: 3 Nights in Naples and 2 Nights in Ischia Island . Guided Tour with English speaking Guide to Naples. Pizza making class and lunch. Hydrofoil tickets Naples – Ischia and return. All private transfers by deluxe van with English speaking driver from and to the airport and from the port to the property in Ischia Island. Tour begins and ends in Naples. Start this amazing trip in Naples. Guided visit of the amazing and lively city of Naples, it will include some of the itineraries where the Elena Ferrante's novel "My Brilliant Friend" takes place": the tiny streets of the old city center, the elegant shopping streets such as Via Toledo, Piazza Dante and Piazza del Plebiscito. You will also visit Piazza del Gesù and the famous street of Spaccanapoli where you will be delighted to taste Naples typical pastry and Espresso. If you like nativity scenes (“presepe” in Italian you should definitely visit the famous street of the nativity scene makers in Naples’ historic city: Via San Gregorio Armeno). Pizza making class in a traditional pizzeria downtown in Naples, at the end you will taste the pizza you have prepared with your own hands under the eye of a professional local pizzaiolo. 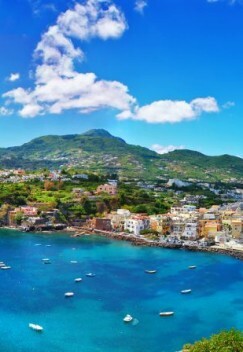 Time to explore the beautiful island of Ischia, with its bright green of the vineyards, the bluish green of the olive groves and the dark green of the orange and lemon groves. Guided Elena Ferrante walking tour of Ischia, you will pass through the Casamicciola Terme (mentioned in "My Brilliant Friend") and stop for phopographs in Lacco Ameno, Santa Maria del Soccorso Church in Forio, Citara's beach, Cuotto village, and take a walk in the beautiful village of Sant'Angelo. Special sunset boat tour of Ischia. A truly romantic experience!